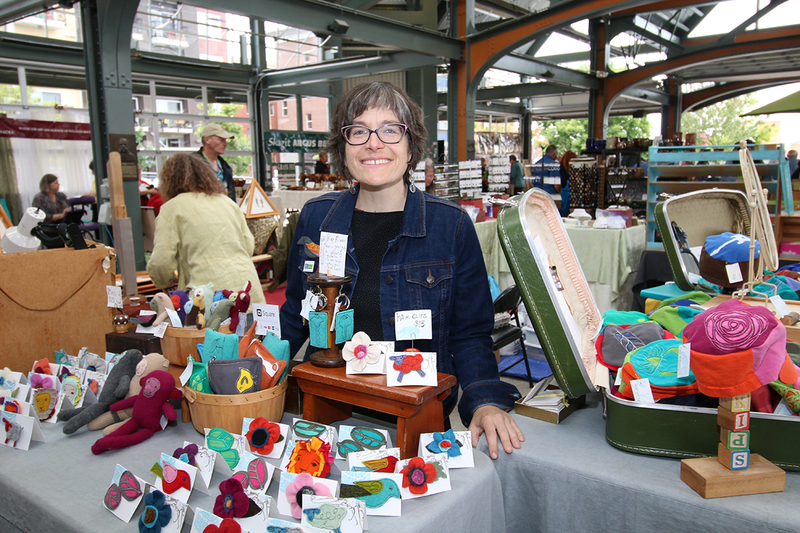 Libby and her recycled fabric creations can be found at the Bellingham Farmers Market each Saturday. Photo credit: Theresa Golden. Not ready to say goodbye to your favorite worn and ragged T-shirt? How about giving it a new life as a monkey or a whale instead? Libby Chenault transforms once loved shirts and sweaters into a menagerie of stuffed animals, hats, key rings and more through her studio art business, Moth & Squirrel. Within her studio at Make.Shift, Libby works with special clothing items found at Goodwill and Ragfinery as well as items donated to her from friends and the community. She starts with larger projects by cutting out necessary fabric for hats and works out smaller pattern pieces as the scraps themselves become smaller. Inspired by color and texture, with a fond appreciation for donated cashmere, Libby crafts and line embroiders each item of her own design with the use of her simple sewing machine. Inspired by color and texture, with a fond appreciation for donated cashmere, Libby crafts and line embroiders each item of her own design with the use of her simple sewing machine. Photo credit: Theresa Golden. Libby learned to sew at a time when Home Economics was taught in high school. Nowadays, sewing skills are less common for individuals and, as a result, Libby has had the opportunity to teach her skills through several venues. At Ragfinery, Libby taught several techniques including hand embroidery, printmaking and applique at a five-day kids’ camp where children ages 7–13 were able to try out techniques for themselves. 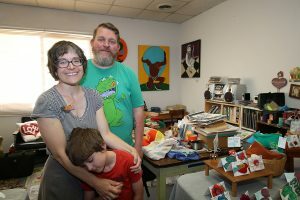 Libby Chenault, husband Steeb Russell and son participate in each Bellingham Art Walk from their studio at Make.Shift. Photo credit: Theresa Golden. 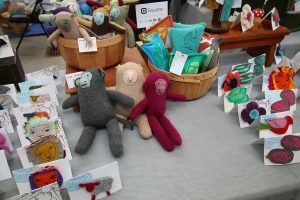 Libby Chenault transforms once loved shirts and sweaters into a menagerie of stuffed animals, hats, key rings and more! Photo credit: Theresa Golden. Libby has also been a part of the Bellingham Farmers Market for the last 10 seasons, bringing her creations in vintage suitcases. Here, unnamed stuffed animals, pieced together with fabric from across all corners of the community, wait patiently to travel into the hands of a new owner — each ready for their own storytelling identity to begin. 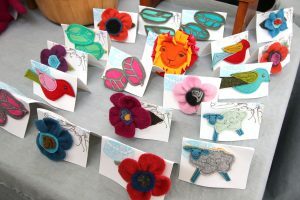 Libby’s designs may be purchased at the Bellingham Farmers Market on Saturdays, or from her studio in Make.Shift during Art Walk. Her items can also be found at The Lucky Dumpster in Edison. Have a piece of clothing you would like transformed into something new? Or maybe you would like to donate an unwanted cashmere sweater? Contact Libby through her email at: mothandsquirrel@gmail.com.